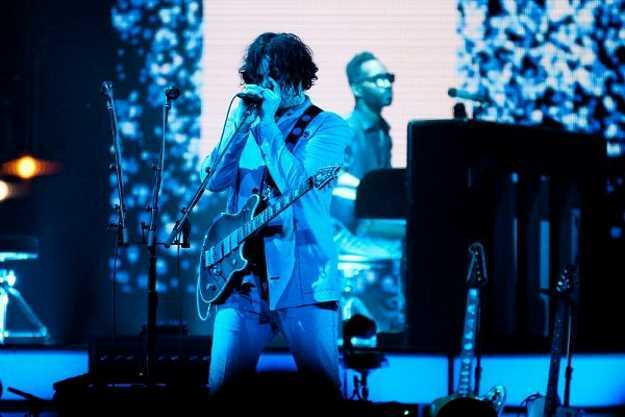 During “Corporation,” the first song in last night’s two-hour set before a sold-out crowd at Jacobs Pavilion at Nautica, singer-guitarist Jack White and his talented backing band embarked on an extended jam that found White taking a musical page out of the Jon Spencer Blues Explosion playbook as he paused throughout the lurching song to chirp, “Who’s with me?” while laying down an incredibly kinetic guitar riff. That opening number appropriately set the tone for the thrilling show that found White revisiting his extensive back catalog and freely experimenting with guitar distortion along the way. Judging by the enthusiastic response from the fans, everyone was “with him” even if that meant patrons had to lock their cell phones in an impenetrable case for the entirety of the “No Phone” show — something that made it difficult to check the score of the Cavs game. White made a joke about the Cavs game too, saying, “I’m so glad there’s nothing else going on in Cleveland tonight, and I have your complete attention.” The fact is, White did have the fans' complete attention. Performing under dim blue lights that often made it difficult to see precisely what he was doing or to make out the members of his band, White had stage presence to spare as he constantly gyrated and often walked while backwards while playing one of his remarkably complex guitar solos and alternating between three different microphones. After practically rapping his way through “Over & Over,” an unhinged track that came off like a cross between Frank Zappa and Rage Against the Machine, White and Co. turned in a gritty version of the White Stripes’ tune “Dead Leaves and Dirty Ground” that featured a feverish jam at the end. White then sang “Why Walk a Dog?” in a hushed voice while delivering a smoldering bluesy solo, and he turned in a hard-hitting rendition of the Dead Weather tune “I Cut Like a Buffalo.” The staccato guitar riffs and precise drum fills gave the tune a particularly funky feel. White returned to the White Stripes catalog for “Fell in Love with a Girl” and “Hotel Yorba.” “Elvis had ‘Heartbreak Hotel,’ and I have this song, ‘Hotel Yorba,’” White said as he began to play the tune; the acoustic guitar and barroom piano made the song come off as if it were some kind of old school-country track. White even inserted a few lines from Presley's “Heartbreak Hotel” into the tune. With its raspy vocals and echoing synths, the psychedelic dirge “Connected by Love,” the single from his new album Boarding House Reach, took on an epic quality, something White emphasized by adding a vigorous organ solo at the song’s end. White's rendition of the the Raconteurs' track "Steady as She Goes" sounded heavier than its studio counterpart thanks to White's adroit soloing. "You didn't think I could do that," he told the audience after one particularly complex solo. Given White's accomplishments in the past (both his bands and his solo projects have all been noteworthy and he even won a Grammy for his work with country singer Loretta Lynn a few years back), we've learned to not doubt the extent of this musician and producer's talent.